Update: WBSSC Upper Primary Documents Verification Schedule/Dates & Intimation Letter for 2nd Phase is available for Download now. 1st SLST TET 2016 Upper Primary Teacher Verification dates are attached below subject wise. Also, download the call letter or intimation letter from the official website of West Bengal School Service Commission (WBSSC) link of which has been given below. 1st Phase Documents Verification has been completed. Also check Updates on WBPSC Food Supply SI Result Expected Date. WBSSC will issue TET Certificate soon. Validity of Upper Primary TET certificate until Upper Primary Teacher 2016 Recruitment process (Interview) is over. Date of interview / viva and downloading of call letter for West Bengal School Service Commission Upper Primary Teacher (TET) posts have been discussed here. Candidates who have qualified for TET Upper Primary Level in WBSSC or West Bengal School Service Commission are now waiting for when the personal interview date or personality test will be conducted in 2018. Clarification regarding cut off date of age & Information Regarding Validity of TET Certificate Notification – Click here. 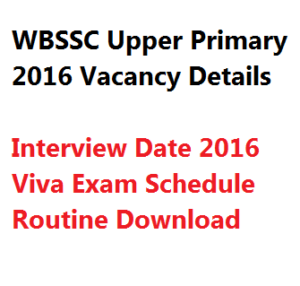 WBSSC Upper Primary Interview Viva Model Sample Expected Questions. The official notification regarding the online application for next step of personal interview of the assistant teacher in upper primary school in West Bengal govt from the online portal of West Bengal School Service Commission which is www.westbengalssc.com. Earlier the notification vacancy for 14088 posts had been published. Trained and non-trained teachers can apply for the posts. Expected / probable tentative dates for interview in WBSSC teacher will be published very soon. The marks distribution or weightage of TET marks and other activities are mentioned below. Certificates of TET 2011 or downloaded marksheets of TET 2015 should be referred for filling up forms. For any help or query call the helpline of toll free number of WBSSC. Counselling for upper primary TET pass candidates will be conducted in 2017 after the viva. 1st counselling, 2nd counselling and call letter and date will be summed up here. Name of the Organisation West Bengal School Service Commission. Exam Name West Bengal Primary TET Exam. Expected Exam Date Updated Soon. Personality Test – 10 marks. “The Central Commission shall prepare and publish in their website with all details of the candidates to be called for personality test (Interview List) category wise on the basis of merit as mentioned in Schedule II Part B in the ratio of 1:1.4 of final vacancies”. Besides a candidate must keep in mind the conditions of criteria imposed by the board. Call letter / admit card for Upper primary TET interview / personality test will be uploaded for download. The call letters will contain the names of venue and time / date of viva for the class 5-8 assistant teacher recruitment exam 2017 for TET pass candidates. Earlier candidates were provided web enable admit card for entering in the exam hall. South-eastern region – 1920 posts. Those who will clear the upper primary exam interview, panel list will be prepared for them region wise. Counselling will be held for Assistant Teachers of Class VI-VIII in various venues. Date of viva for the upper primary teachers in WestBengalssc will be intimated later on when they will have completed the previous processes. Download PDF notification – Click here. For more study materials, interview tips, interview mock questions etc. visit www.jobsandhan.com. The latest WBSSC notification for online apply for the personality test or second phase (Step II/ Phase II) has been published. Candidates need to apply online and submit respective fees online or offline. You can also download the vacancy details / district wise / school wise and location / venue wise vacancy list PDF file from the official website of the Westbengalssc. Personality test most likely to be conducted on 2018. Call letter / admit card / e-admission certificate download link will be provided to the candidates very soon. All the Best to the applicants. First phase verification kB or kaha hoga??? I think the wbssc comission’s most of the employees died so they are not publishing the verification date…………………………..
are 2012 tet passed candidates eligible for the 2018 upper primary verification? I UP PASS 2016 MARKS 104 MP 67% HS SCIENCE 61% BSC PURE PASS 40% BED 57% CATAGORY OBC A . WILL l CALL TO INTERVIEW? PLEASE INFORM ME. Ami upper primary tet a written test a pass korechi 60% peya.ami M.A 1st class plus B.Ed korechi.Ami ki interview a call pabo. Ami upper primary tet a written test a pass kore6i 60%peya.ami m.a 1st class plus B.Ed korechi.ami ki interview a call pabo. Upper primary TET Certificate date of validity ki increase or barano hoeche? I have qualified in last TET exam for upper primary . Now I hear that school service commission has declared to distribute TET certificate. But I don’t know in which date it will be distribute. Please give me a valid information with government G O.
agar nahi mare hote to ab tak kuch na kuch to processing hota hi. I HAVE QUALIFIED TET WITH 91 MARKS (OH) CATEGORY.NON TRAINED .2015UPPER PRIMARY TET.WILL THERE BE A CALL FOR VIVA.SHOULD I WAIT. Interview er kono khobor ache ki? kotodin por hobe? case er sab jhanjhaat kokhon mitbe? I am nantu kumar das . Qualified tet upper primary.percentage 68.7. May I called personality test? Respected sir or madam amar madhhyamik a 69%,h.s 72%,graduation a bengali honours a 52% marks ache.ami obc-B.tet a 83 peyechi.bed training kara nai but d.el.ed training korchi (1st year).amar ai job ta paoar chance ache ki?ar upper primary ar interview kabe habe please aktu janaben.ar kato din time lagte pare? Upeer primaryer viva hoba bola mone hoi na.teta 97 paechhe.b ed achha,science streme,mp-73 percent,hs-60 and graduation 59 percent achha.sarkarer motigoti valo noi. b-ed ache ami ki job tai asa rakhye pari??? ami upper pry tet pass krchi. Kobe interview date thik hbe pls email e jnben. Thanx. Upper primary interview kabe have? Tet passed with 112 score. Graduate with zoology. BEd final year. If within the time of waiting for call in UPTET I complete BEd then should I be called? Upper primary tet interew kabe habe? Sarkar late karchhe keno? Total up score 78.93 eng sc candidate may I get the job. Tet-a 51pachj 90ar Nashua SC bed acha ami call pabo ki viva for upper primary? Amar score upper Sanskrit language group out off 90 te 72.66( SC). Amar SC te Tet 100. Amake janaben plz. Upper tet 5-8 interview DATe kobe? upper primary recruitment niye complicity kobe mitbe…?ei recruitment ses holo na…new primary te recruitment procession suru o hoye gelo…ato ta indifferent kno e bpr e? upper primary tet qualified candidate der interview date or document verification date r kno update nei kno. ?recruitment complete hote ato time kno lag6e?? when wb upperprimary will be started? please post comment in this page. when wb upperprimary will be started? please post coment in this page. Interview er kono khobor achhe ki? Upper er personality test Kobe hobe? Obc b male.kono chance achhe? Upper primary personality test kabe habe. Respected Sir/mam,my upper primary score is 93;sc candidate and B.ED,may I get any chance Upper primary school. Please inform me.subject social science. Respected Sir/mam,my upper primary score is 93;sc candidate and B.ED,may I get any chance Upper primary school. Please inform me. I am TET qualified obtained by 99 marks. My academic score – 63•5%(mp), 54%(HS) & 65%(B.Sc.). I am a candidate of bioscience. So, most humbly I beg to state if I can get the call of interview. amar upper primary te academic r tet result miliya 74 hayecha amar ki interview te dak paor chance acha..
i am amit ,my tet no….is 94 and i am b.ed qualified, can i call for interview.? Upper primary tet interview kobe hobe? Keu ki kichu bolte parbe…. I passed TET and got 61% marks. I am physically Handicapped person.I have Special B.Ed ( RCI ) and completed D.El.Ed Course.May I get chance in Upper Primary School ?please Reply. Friends upper primary tet pass certificate ki deoa hoache?1 year hoye gelo but akhono ami certificate paini.kabe debe & kotha theke collect korte habe ai bisaye please kau help karo.please! Friends upper primary r tet certificate ki kau peyecho please janao.1 year hoye gelo but ami akhono paini.tomra ai bisaye kichu janle please janao. Upper primary tet pass candidate ra ki kau tet pass certificate peyecho?certificate ki deoa hoache?ami ai bisaye kono khabor paini.kau please janao.kotha theke collect korte habe setao janao.please. Ami tet a 92.Bsc plane with math.Parateacher in a high school from2004.Aca 61%,44.6%,45.8%.SC categories. Amer interview a call Pawer chance kotota? Ami plane Bsc with math,Para teacher in a high school from 2004, . SC catagori.MP 61%,HS 44.8%, Bsc 45.6%. Amer interview a call Pawer possibility kotota. I passed TET and got 61% marks. I am physically Handicapped person.I have Special B.Ed ( RCI ) and completed D.El>Ed Course.May I get chance in Upper Primary School ?please inform me. tet weight is 76.92. general catagory. pure science. i will get chanch interview. plese reply. Just few days later… up TET interview will be started………..
Upper primary interview Kobe hobe? Please tell the date of upper primary Interview. Is it possible within the month of September. upper primary r jonno interview date kobe berobe kichhu jana jabe ki? Shona jachhe ekhon thekei untraind der10 lacs ar traind der 6lacs kore taka niye interview panel tairi kora hochhe. Exam result boronor por etodin time lage interview nite? Jara taka debe tader kei interview e daka hobe ar tader e chakri hobe. Ar jara taka debena tader koyek jon ke interview e daka holeo tader chakri hobena. Upper Primary interview hove Na………………………..?TET certificate 3 years par hole tar pore interview hove chi? kono din o recruitment hie ki..
BA (3years new Regulation)Pass 2002 with 48.36%, TET 97 marks, no B.Ed. GEN. can i got chance? BA (3years new Regulation)Pass 2002 with 48.36%, TET 97 marks, no B.Ed. can i got chance? BA (3years new Regulation)Pass with 48.36%, TET 97 marks, no B.Ed. can i got chance? My M.P 49.34% (Compartmental), H.S 42.3%, B.A (3yars new Regulation)2002 Pass, TET 97 marks out of 150, no B.Bed, Cat-GEN. can i got chance for Interview? recruitment hbe ki..?? how many years required for recruitment?? I am prabir Biswas. I was got 98marks. I have no B. ed degree. Have any chance for me at viva? upper primary tet qualified candidate der bonchito kora ho66e…30 th march r moddhey exam nile ato problem e hoto na..onek bekar 6ele meye k ato tension and job insecurity r moddhey porte hoto na..akhon jara govt e a6e tara i66a kore e ei critical situation toiri korlo..
Amar academic score 76.66 Geography Ami interview e dak Pete pari? Please janaben! Ami upper yet qualifying marks 92 peyechj,M.P.te 58%,H.S. E 48% and B.Hons e 46%[History],OBC-B, Ami ki interview re dak pete,and job Pete pari? Are u trained or non trained? Ashim… If u r non trained, then Your score will be 63. If u belong to Reserve Category, then obviously get the chance for Iterview…. Mam I qualified up yet score 94 and m.p_80.5%. H.s_71.6 bsc (math)_55%. …Ami ki dak Pete park.?? When will be the interview start.since last 1 yr we h’ve been waiting for d interview. Is this kind of educational system will progress our state or country…. shame..
Upper e pure science der sujog kmon… Janaben plz…. Madam non-trained candidate der ki interview te daka habe?naki sudhu trained ra chance pabe?please janaben. Training na thakle ki interview te dak paoar samvobana ache?naki sudhu training jader ache tader daka habe?? Respected sir/madam Ami madhyamik a 69,h.s a 72%,graduation a 52% marks niye bengali honurs korechi.ami OBC-B.upper primary tet a 56.66% marks peyechi.BED nai.ami ki interview te dak pabo?please aktu janaben amar ai job ta paoar kono chance ache kina? i am bca graduate from makaut and i have ded.can i eligible for westbengal upper primary tet in science ? Karo MP&HS e 50% marks nei she upper primary te pass Kore thake tahole se personal test e dak pate ki. Dear Admin, I am Joy Kr Bepari from North Bengal. I’ve gotten 100 out of 150 on upper primary examination. I am belonging to s.c category and my h.s % is 60% above. I’d completed my graduation which had belonged Eng(hons) with 54%. But unfortunately I have no b.ed degree. Is there any possibility? UP Te seat increase hoye 20000 holo naki? 16 th June Ki sotty Upper Pry. List publish hote cholechhe Ma’m???? Ami ST ,98 peyechi d .el .ed karechhi.interview te call pab ? Please bolben? Kobe upper primary tet er interview hobe please janabe? upper primary tet e d.el.ed odl accepted hobe ki na? IX-X, XI-XII recruit er por Approx. koto trained student Upper pry. te pure sc.a ache janaben pls. June er 1st week e viva hote pare! Ami upper primary tet pass score 97 category st kintu b. Ed kora nai. Ami ki inter- view te dak pete pari? Upper primary r interview ki adou hobey pls janan. .
Ami 2011 Saler tet exam qualify korechi. Marks 75.83%. Subject Bio-sc (pass), Amar ki kono chance ache interview te dak pabar? Plz janaben. Ami 2011 Er TET exam e qualify korechi. Marks 75.83, amar sub. Bio-sc pass..amar ki chance ache interview te dak pabar? Pls janaben. Interview aro kotodin por hobe? Dear ministers, apnara ki ghumiye porechen? ebar ontoto uthun..tet result berono 6 mas hoye geche..kokhon interview neoa start korben? ar koto ghumo ben ?????????? Upper primary interview ki march e hote pare na April e hobe keu bolben please…. Ami bsc bioscience hons kintu slat upper primary tet pass kore pure science e apply korechi.eta ki pure science e apply kora jeto? 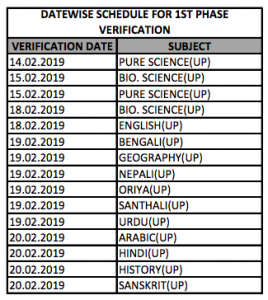 Upper primary tet er interview ki march e hote pare na ki April e hobe..please keu ki bolte parbe…..
Ami graduation e bio science(Hons) kintu apply korechilo pure science e.tahole ki Amar form ta eligible hobe? Hist (H) 50% upper primary tet pass koreci. Tet a105 payeci. B ED nai. SC. Interview a dak pabo Ki? Interview Kobe hobe please janaben. Plz inform the interview date…. Ami social science e tet pass Kora.. Kintu amar bca thakar jonno kono arts subject er opore interview form fill up korte na parai ami science e apply koreche bez bca te math chilo.. Ami ki call pabo…..? Ami b.tech in computer science. Tet pass. Marks 121. D.el.ed ache. Admin ami jogya to? Kindly inform. Pure Sc. a trained er Sonkhya km n? Kew janle reply Koro pls. 31st. A March er modhye Upper Pry. re niyog samvabata hobe na… April a State Government decision nebe. Madam, Ami amar upper primary admit card hariyechi. Interview te Ki problem hobe? Amar Ki Kora uchit? Please help korun.. . I have scored 115 in tet and my academic mp 84%,hs 72%, eng(h) 55%. Have any chances to call? Interview te ki sobai k dakbe? ?pls mam inform us.. I HV got 86 and category is OBC so can I get chance ? What will be of the upper primary TET qualifier after 31 march who are non trained.pls reply. Please tell me ,uperprimary interview date published. Amar wife upper primary pass koreche.interview r jannya wait korchi.Admin mam plz inform me estimated date for Viva.I have a tour plan in first week of April.Should I proceed for the tour or cancel it?I am very much confused. Interview date er kichu din agei intimate kora hobe, so u can act accordingly. Respected Admn mam,any news update about upper primary viva? Ami Bappaditya das.amer baba 2012 year a tet pass koreche kono D.ED ba B.ED nei amer baba ki viva r jnno dak pabe. Akhn amer baba r age o ses . Graduation a amar 50% Marks nei, General category.. D.El.Ed. achhe…. Total score 71.6. Pure. Sc. a call pabo Ma’m?? Admin Ma’m, SLST (IX-X, XI-XII)er result aage ber Hobe na Upper Pry. er result list aage ber Hobe? Reply please. Upper primary interview call letter age released hobe. ami sosal science a tet pass koreche ..but ami bca student.tai graduate a math chilo jonno science and math a apply koreche interview er jonno ..ami ki call pabo ??? Upper primary Viva Kobe thike start hobe..
31st march 2017 por ki non trend der ki recruit korte parbe.. Pls reply din. Upper primary interview er notification ki ei month e deoa hobe naki march e berobe? kichu news janle please bolun Admin madam. Ami mp70prsnt.hs55percnt.hons (45)eng.hons and pass 51percnt.tet 113.intrvw e dak pabo ki?pls janaben. Ami Upper primary level er form fill up ta miss kore felechi. Kintu amio Upper primary Tet passed. M.A korechi. Ekhan ki korbo ektu keu bolbe please? Ami qualified korechi upper primary tet a.Interview call Kobe nagad aste pare? Ebong janabe ki SMS er maddhomei ? most probably sms er madhhomei krbe, kintu tar age notification ber hobe. Respected sir/madam. Amar tet score ache 62% Ami call pabo? Upper primary interview Kobe hobe? Dear Srabani, Upper primary interview notification will be out within March 15 most probably, and the cut off marks & probability / chance can not be guessed. You need to wait until the upper primary interview panel list is out. Dear Ashok ji, kindly wait until the list is published. There is no definite procedure by which we can guess the expected cut off. Aami 2012 te uprimary tet-e75.9%peyechhi.bed nei.Bio-sc-e below 50%.Aami upper primary para-teacher. Aami ki interview er Jonnye sujog pete Pari? Amar upr pri tet e 106 ache.ami spl b.ed korechi.spl educator er rci certificate ache.ami upr pri viva te dak pabo ki? Primary r moto ete o ki Sokol k interview e appear r sujog dewa hobe? Ar 2011 and 2015 candidate Der ki individually list berobe? Tet score 118.over all 79.46 score.general.history.vacancy increase er chance ache? Upper tet er interview r hobena. Jara 2010 er age B. A pass Korechi b.ed deegree ache Kintu 50% B. A te nei ncte norms and regulation anujayi tet pass ra interview e dak pabe. Amy upper primary TET a 119 payachi,sub-Bengali,category-S.C,academic r tet ar marks mila 90ta- 69.73………dak pabo ki interview ta…? Ekhane k kon subject er against a apply korchhe, seta ullekh korle valo hoi… Takhon tar call list naam publish er probability anuman kora jete pare…. Admin Ma’m, sunechhi j Upper Pry. te seat barte cholechhe approx. 22000. Eta Ki thik?? Ami upper tet e 97 peyechi. Amar bed ache. Score hoeche 71.2 % amar ki chance ache?? R upper tet er interview ta kokhon hobe? Kobe date deoa hbe interview ar plz Janan Ak2…..
kbe upper primary interview hbe……………??????? pls reply………..
amr B Ed nei ami ki interview call pabo ? Will d commission inform d viva date to individual candidate through ph or mail? Most probably. But at first notification will be published regarding the interview date. My daughter has got 99 in Upper primary written tet exam , She has got 80% in maddhamik,59% 1n HS,63%in geography major, She is in obc category, and applied for southern Jones arts category. Please tell as he is illegible for viva or not. Interview hote aro kotodin somoy lagbe? prothome x to xii requirement hobe tar por upper primary r interview hobe is it right? Please reply Admin madam. most probably, upper primary er interview age hobe. Work Education &Physical education er recruitment sob seshe hobe….. Ei matro Janlam…..
Apatato 2nd. week of Feb. 2017 motamuti thik korechhe WBSSC…. Eta confirm news…. Tobe date t ekhono final kore uthte pareni…. Anamika Sen is also eligible for Upper Pry. Exam. Rajani Ji, 50% Marks is mandatory for B.Ed. students; not mandatory for D.El.Ed. or Non-trained student. Thank you so much. .Mr Joy, for giving me a right information. Yes Shanti Ranjan. D. El. Ed. Treat as trained in Upper Pry. Upper primary interview dt. Kobe declare hobe ektu janaben pls.ami chemistry(honns)graduate.b.ed ache.O.Bc caste.bartaman e ekti govt.primary school e teacher i kori.2010. Sal theke kormoroto.M.P & H.S e 1st div.& graduation e 2nd cls ache.ami ki interview call letter pete pari?kindly janaben. interview date ekhono declare hoyni. No latest news regarding viva date. ami upper b.tech candidate.ami upper e arts e bose chilam o pass koreche.but combination subject na thakar jonno science a apply koreche.bez amar college a math chilo.ami ki eligble na cancel kore debe amak e.???? Ami upper a 102 peyechhi. Graduation a 50.66 peyechhi. …kintu B.ed ney. ..De.el.ed achhe. Am I considered as a trained candidate? Please reply. .
yes 50% marks in Graduation is mandatory. Iss page se aapko pata chal jayega jab interview date declare hoga. Amar tet+ academic milye 64 hoyeche,Ami obc a category bengoli te apply krechi..amar b.end nai.So can I get interview call for super primary?? Pure Sc. a approx. koto trained ache? upper primary sc education qualificion ki? accha next wb p tet kbe hbe?? UPPER PRIMARY INTERVIEW DATE KOBE HOBE AKTU BOLTA PARBEN PLZ. Date ekhono dayni, date declare hole ei page e janie deoa hobe apnake and apni interview call letter & panel list o peye jaben. Ami pure sc(chemistry)hons er graduate.b.ed ache.tet e 106 peyechi.academic score e 95 % ache.bartamane ekti. Govt. Primary school e teacher i kori.ami ki interview te call pete pari?jodi janan khub vali hoi.khub duschintai achi. sir/madam,ami jante chaichi Kobe theke uppar primaryr inter view suru hobe?ami ki vabe jante parbo?ami 2015te tet pass korechi. Up tet 76.53% .call pabo ki? Ami upper primary tet pass korechi amr marks 112. Academic qualification 72% but b.ed nei. Ami ki interview te dak pabo? Ami b tech.(mechanical). ami kon sub er opor apply korbo? Ami 2015 tet pass kore6i. ami upper primary te 100 paechi…… amar ST ache. amar education qualification 70%. amar b.ed nei. ami ki interview te dak pabo….??? please bolben group d recruitment exam exactly kobe hobhe? Upper Primary r interview kobe hobe? Upper primary tet interview kobe hobe? ami janta chichi j 1st slts ar interview date ta koba bolta parben ki ? Slst exam er por ki uoper primary interview date dibe, janle pls call ba sms karben 9933754179. I have passed up tet twice. I have got 127 marks in tet. I have B.Ed degree also. I have got 76% marks in M.P. 71.8% in H.S, 54% in graduation and 62.1% in B.Ed. Is there any chance to get the service? When will the interview process start? As it is a competitive exam, nobody can assure that you would be qualified or not. It depends on ur competitors also. Interview / personality test will start very soon. Keep an eye on the post. We will update as soon as we get the news. Name /reg no wise routine / schedule has not been declared till date. I am pappù gupta . I got 87 marks in tet exam I am obc-B category. And apply in Hindi medium for history . Please interview kobaý hobay bolo na . socal science pass kora candidate ki science a apply korte parbe jodi graduation a math thake???? I want to know my position I get114in upper primary and I applied history my total marka78.4%.can you tell e I am select for inter view. AMI UPPER PRIMARY TET -E PASS KORECHHI. VIVA KOBE HOBE JANA JABE KI? Ami upper qualified,bengali subject,academic score 70.2 b.ed ache.any chance for interview. aami upper tet e 59.33% pechi kintu aamar b.ed neu ,r aamar geography honors aache aamar hobar kono vhanc aache ki, interview kobe hobe? Upper primary interview kobe hote pare keu jano? amar graduation complete hoeache 2014 te abong Ami b.ed koreche 2014-15 te dotoi amar granted hobe to ? Sir original verification a bed ar certificate markshit dekhale habe?naki ncte letter must lagbe? Tet r j 40 number r kotha ta bola hoya6a sata ki vaba bivajon hoba. Please janna. from which site I will get the marksheet?? ?please help me. Ami Amurba Ghosh ,ami 56%peye ei bosor tet pass koresi,b.sc. (general )e 61%peyesilam,hs e 54.8%peyesilam,mp exam e 74.25%peyesilam,amar ph certificate ase.ami ki job ti pabo? ?please bolo. Tumi pass korle ki kore, minimum 90 pte hobe mane 60% and you get 56%. how r u qualified? Oh byata PH Category Te pass korechhe.. I ‘ve qualified wb upper primery tet and I am bed also. I applied in history for Hindi as a medium. Do I have chance to get in selection. Upper tet pass. persoanality test e ki call pabo. Sir, I am Rakhi ghosh, D/o Nikhil Ch. Ghosh. I missing my admit card. Please check my result and send my email id and send my roll no. My contact no – 9888104251. My email id – [email protected]. I request to you please help me. Thank you. I am sunam Sarkar. I’ve qualified upper tet. Marks 119 English subject.b-ed passed.is there any chance to get the job? I am graduate in English honours and History and Polical science as pass subject. Pass subjects contain 300 marks each in graduation. Can I eligible for Upper Primary and IX-X level assistant teachers in History subject under West Bengal School service commission ? ami up tet pass korechi, b.com pass . kindly janaben ami kon sub e apply korte parbo? I am debasish dutta. Iqualified upper primary tet.My makr is 99,but I have no b.ed certificate.I am completing d.el.ed. course. so please tell me i have any chance for gate this job? I have passed upper primary TET,scored 104 in social stuty. Ihave 2 years D EL ED. I am an exserviceman. I want to know, if there is any exserviceman quota ? Since it is a c group job. completed d el ed but don’t have 50 % in graduation ..am I eligible? Ed. Will I get academic marks. Sir ami 2012-2014 a M.A korechi r 2014-2015 a B.Ed korechi to amr M.A and B.Ed certificate dutoi granted hobe to? hi ami to kichui bujthe parchina. I am Reshma Parvin.I qualified upper primary tet . Kindly inform me region wise vacancy in history for West Bengal upper primary . Upper Primary TET( Social studies) e Qualify korechi , Amar Political Science e Honours ache ( Pass subject : Economics) …Kintu bujhte parchi na kon group e apply korbo? Kindly help korben .. I am subhasis paul. I qualified upper primary TET. My marks is 97.but i have no B.ED certificate. So please tell me i have any chance for get this job. WERE YOU ABLE TO FILL UP THE SUBSEQUENT FORM? IT WAS ASKING FOR MANDATORY B.ED DETAILS. upper primary te D.El.Ed(ODL MODE) ki granted? Amar bio sc (hons) Ami sc study the tet pass korechi ,Ami ki sub apply korbo? Social Science e pass kore tet then science e interview dowya jabe jodi graduation e math thake…?? pls tell me..b.ed chara ki kao ado paba . ?..ja bed pass korache satai to purno hobe na..non bed a ki alada vacancy ache..? Social Science e pass kore ki science e apply Kora jabe jodi graduation e science subject thake…? plese refer your subject Science/arts? I am a candidate of bioscience[zoology(H)]. I am TET qualified with 99 marks.My academic score – 63%(mp); 54%(HS) & 65%(Graduation) . I am non-trained. So, is there any little possibility to get the job?